Starship Troopers: Traitors of Mars Region 1 Free Shipping! 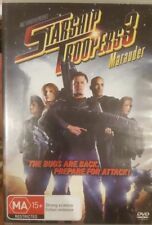 5 out of 5 stars - Starship Troopers: Traitors of Mars Region 1 Free Shipping! 1 product rating1 product ratings - Starship Troopers: Traitors of Mars Region 1 Free Shipping! Starship Troopers [DVD]  [Region 1] [US Import] [NTSC].